Near Cannon Ball, ND – Ending a week that has seen the profile of the protests over the Dakota Access Pipeline rise, several alternative media sites are carrying reports from the Standing Rock Rising Facebook page that at least two officers involved in police activity against water protectors have turned in their badges. Police agencies from several states have been mobilized to the location in recent months and it is both unclear which agencies the police belong to and whether or not this has actually happened. The protests, which have seen increasingly violent measures taken to disrupt them, have been ongoing since April, though the issue of pipeline construction on land held sacred by the Standing Rock Sioux Tribe goes back several years. From the end of last week to the beginning of the current one, over a million Facebook users began “checking-in” at the location of the Sacred Stone camp in North Dakota. Originally intended to mitigate the ability of police in the area to track activists involved in demonstrations, it caught the attention of major media outlets such as NPR, MSNBC, and CNN which have taken criticism for devoting little effort to cover the protests. Indeed, much of the news and updates from the DAPL site have largely come from smaller, independent news outlets such as AJ+, Vice, Unicorn Riot and Democracy Now! among several others. In early September, journalist Amy Goodman of Democracy Now! was present at a protest site where private security unleashed pepper spray and attack dogs against unarmed water protectors. Since then, there have been several arrests of journalists, often undistinguished from the water protectors by police. Goodman was, for a time, even brought up on rioting charges. Other reports have surfaced which show chainlink fence holding cells where dozens of activists have been held after a series of sweeping arrests in recent weeks. In another incident which took place on November 3rd, a reporter was apparently shot with a rubber bullet at random. Police voluntarily turning in their badges would be an encouraging sign to those caught in the midst of disruption activities and surveillance, including the use of drones which could be armed, that their cause is on the right side of history, though as of this moment, Love and Rage is not aware of any specific law enforcement entity reporting officers doing so. If indeed police are beginning to object to their role, now would seem like the time as public pressure mounts as solidarity occupations and rallies have popped up in places like Cincinnati, Minneapolis and New York’s Grand Central Station. As actions spread elsewhere, the North Dakota state Capitol was the scene of a clergy-led protest yesterday that led to the building being shut down as well as the arrest of up to 14 people who held a sit-in in the Capitol’s judicial wing. 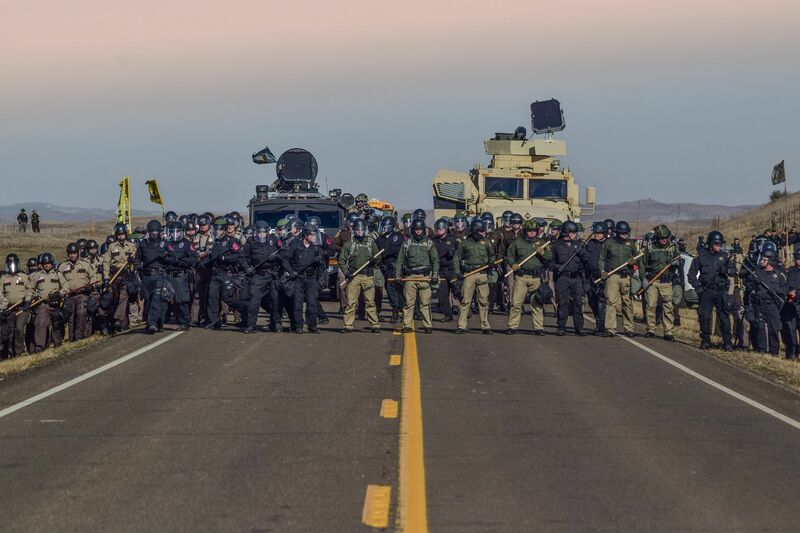 Resistance to not only the treatment by private security, law enforcement and the National Guard in response to water protectors, but to the concept of building a pipeline to begin with, has been steadily growing as the protests gain more face throughout the nation and abroad. It does seem likely that officers could be turning in their badges as a result.